Note: this page was written mainly round 1998 and 1999, and I stopped updating it round 2000. 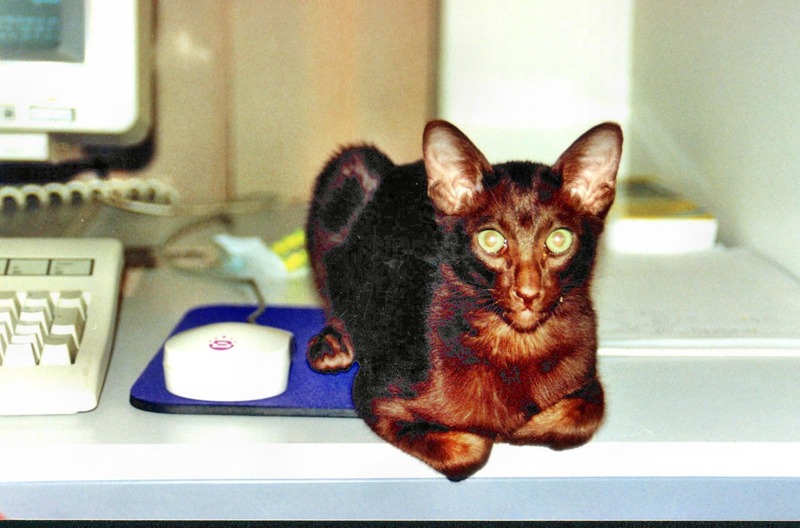 The last cat on this page, Lilac, died on 10 August 2015 at the age of 18½. 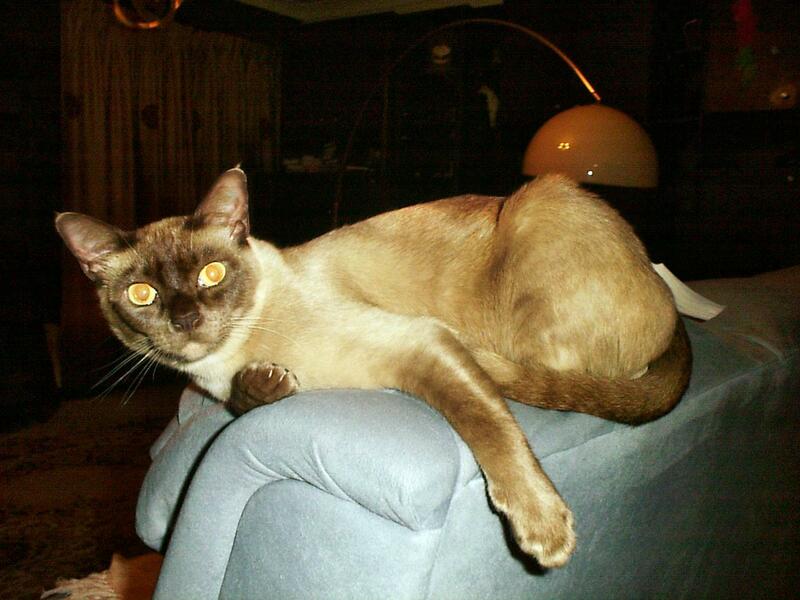 I'm now keeping photos of our cats on our domestic animals page. 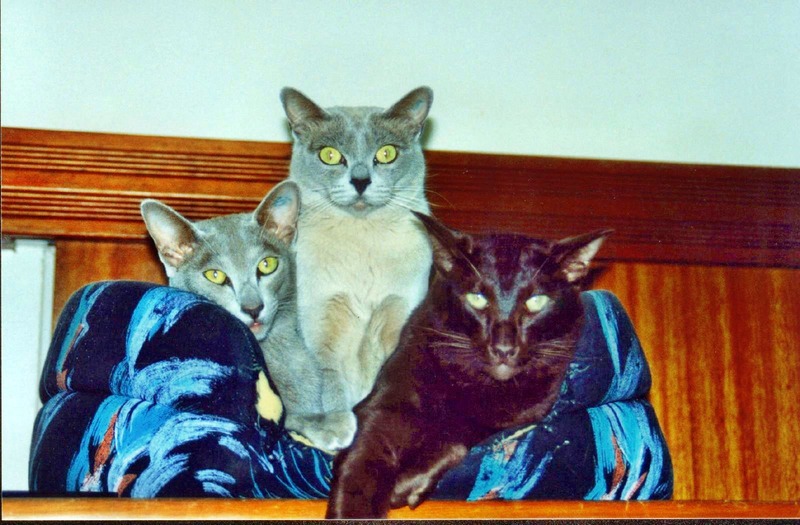 In a previous life, I used to breed cats. 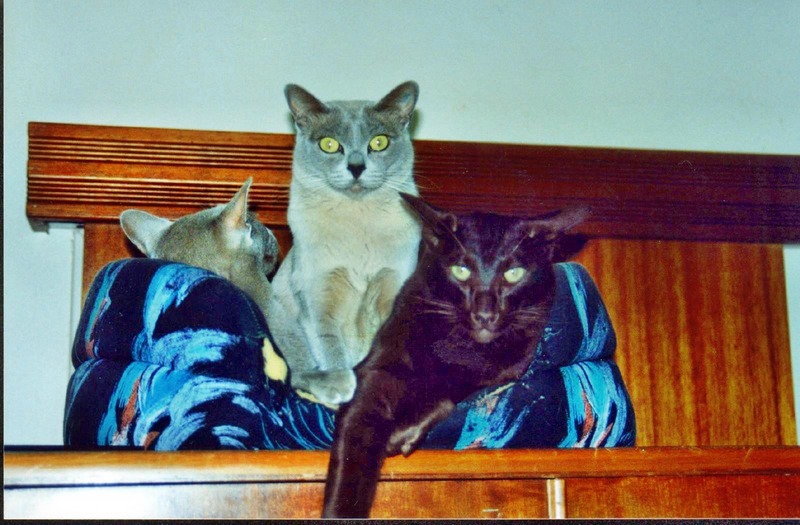 I had a particular liking for Burmese and Siamese, and after returning to Australia (and reluctantly leaving behind my all-time favourite cat, Queenie (Reine de Saba vom Hohen Roß)), we bought two Burmese, a chocolate male whom we called Choc, and a lilac female called Lilac. C, the imperfectly dominant allele, is also the normal gene. 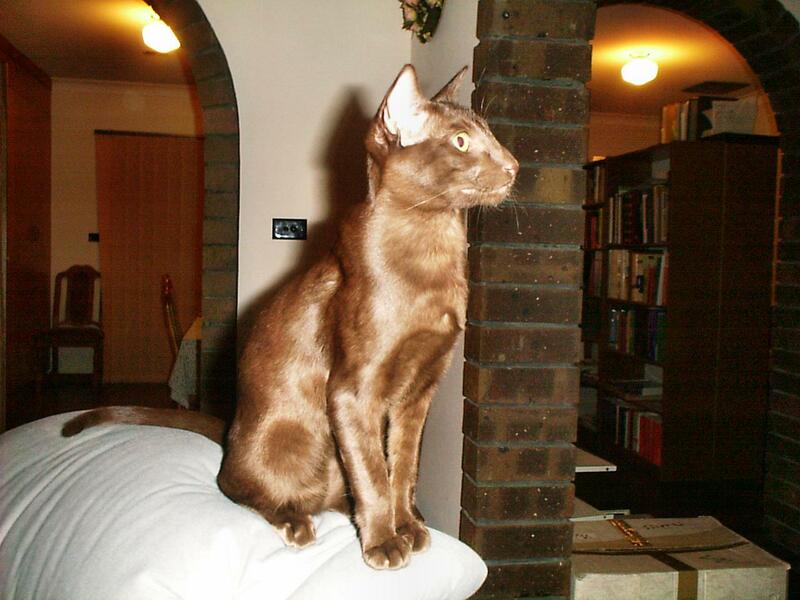 Cats with this gene are called self-coloured. 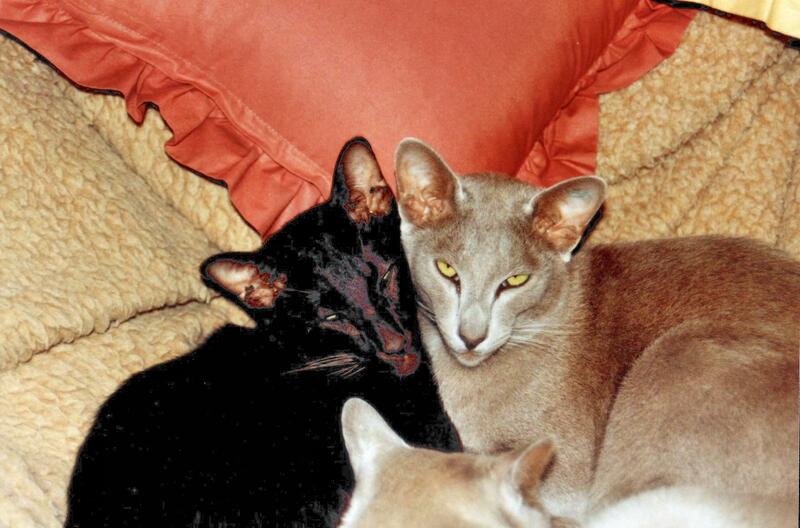 For example, a black cat will always have at least two C genes. The cc gene is found only in Chinchillas. The cb gene is found only in Burmese (the subscript b means Burmese). The cs gene is found only in Siamese (the subscript s means Siamese). The ca gene is found only in albinos. There are currently no recognized breeds of albino cats. 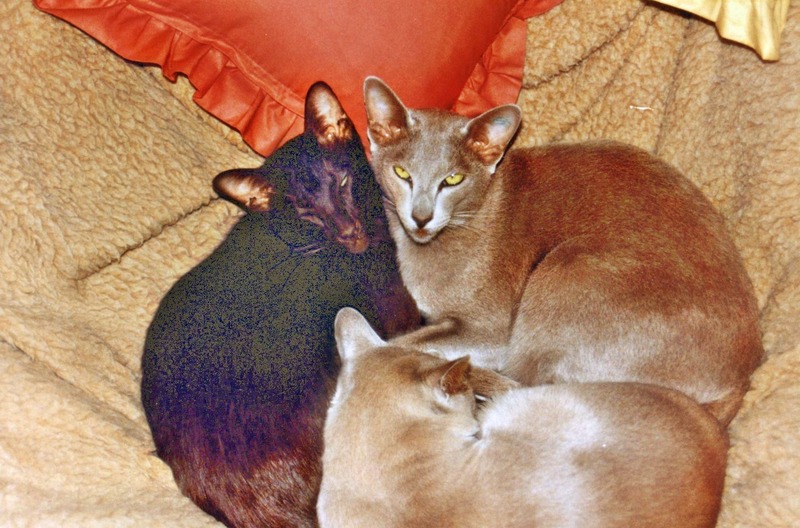 The B (black) gene controls one of the colour attributes. B, the dominant allele, is also the normal gene. For example, a black cat will always have at least one B gene. b, the only recessive allele, is also called brown. It's very rare except in orientals. 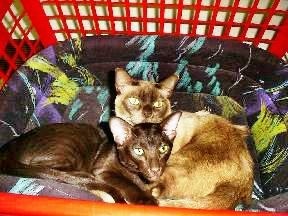 In Burmese, it gives rise to the colour called chocolate, in Siamese chocolate point, and in self-coloured cats it's called Havana. The D (dilution) gene controls another of the colour attributes. D, the dominant allele, is also the normal gene. For example, a black cat will always have at least one D gene. d, the only recessive allele, is also called blue. 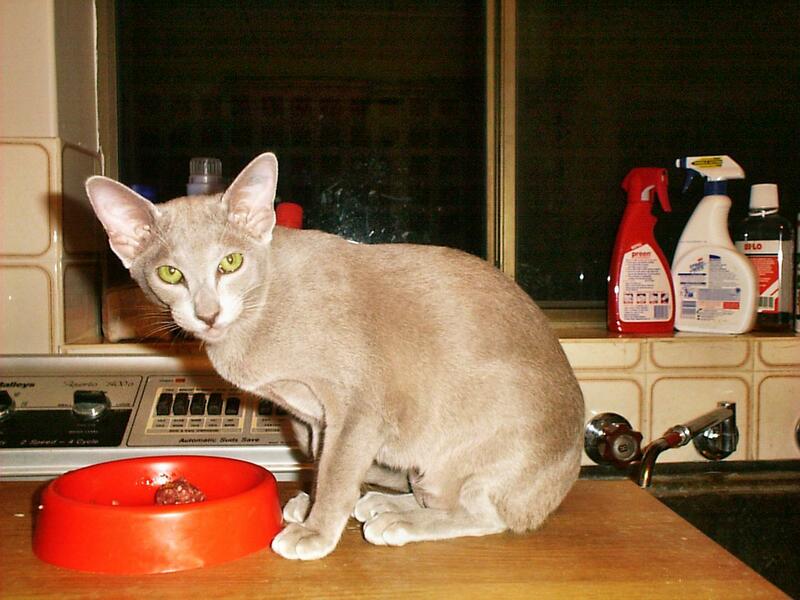 In most cats, it causes the coat to take on a greyish colour, which cat breeders call blue. 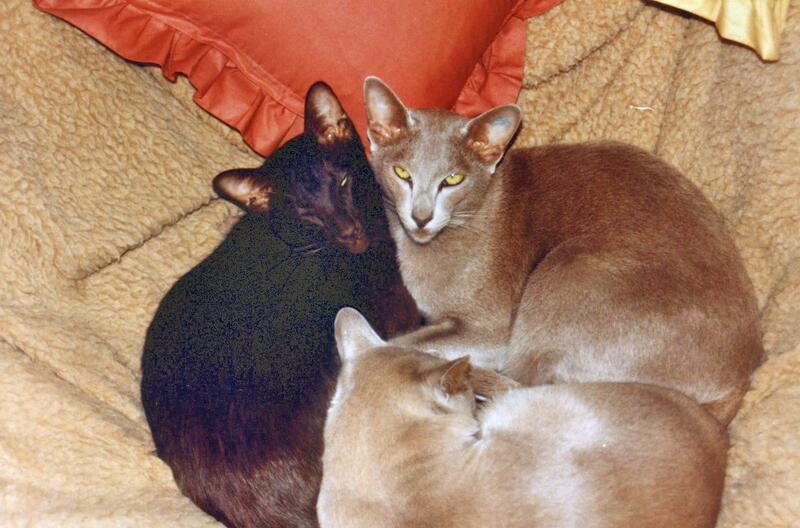 Burmese blue are somewhat lighter in colour than self blue, and Siamese blue point are decidely lighter than others. 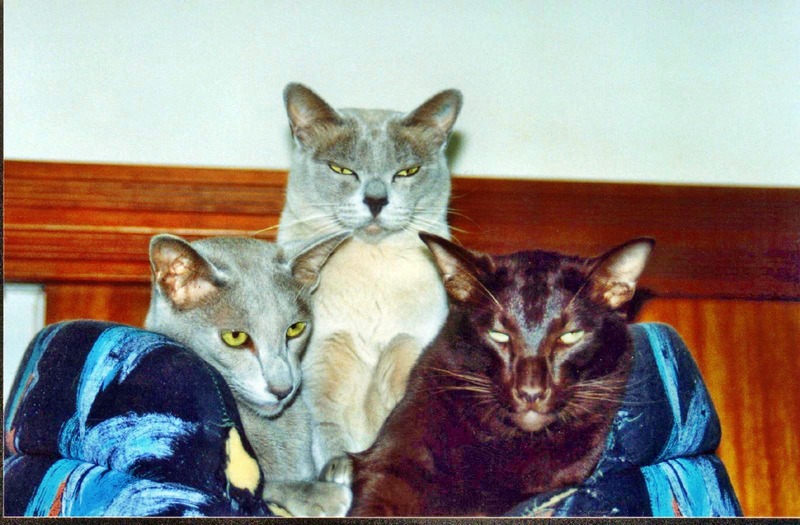 Some breeds are only blue, such as the British Blue and the Korat, both of which are self-coloured (at least one C gene). 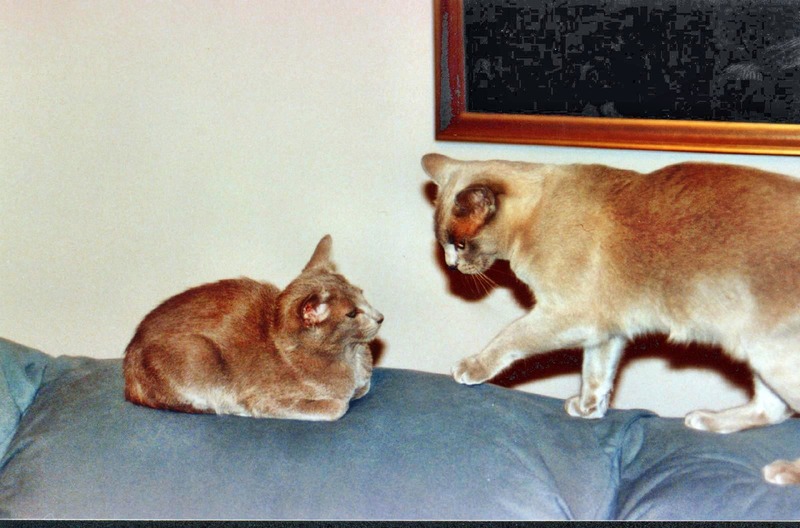 There's also a fourth gene, O, which is responsible for red (“ginger”), cream and tortiseshell cats. It's interesting because it's located on the X chromosome, and it's imperfectly dominant, so its behaviour depends on the number of X chromosomes a cat has. 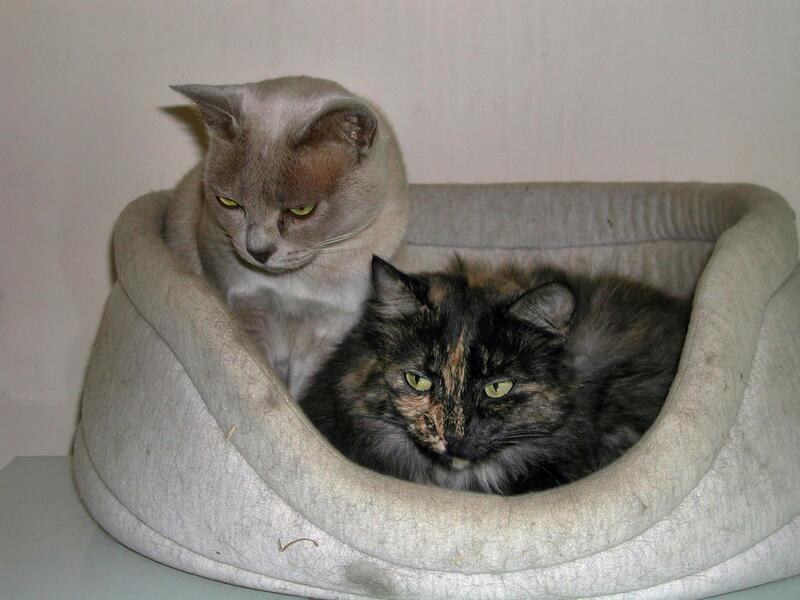 This explains why tortiseshell cats are all female. Maybe I'll expand on this some day. So, now that you know what we're talking about, you'll understand our cats. Sadly, of the four that I describe here, we only have one left, Lilac. 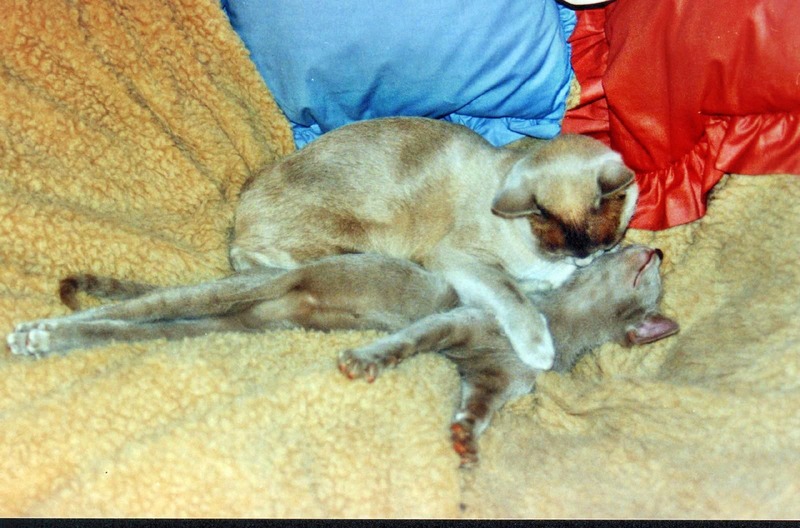 Choc was run over in February 1999, and Monty was run over in November 2000. 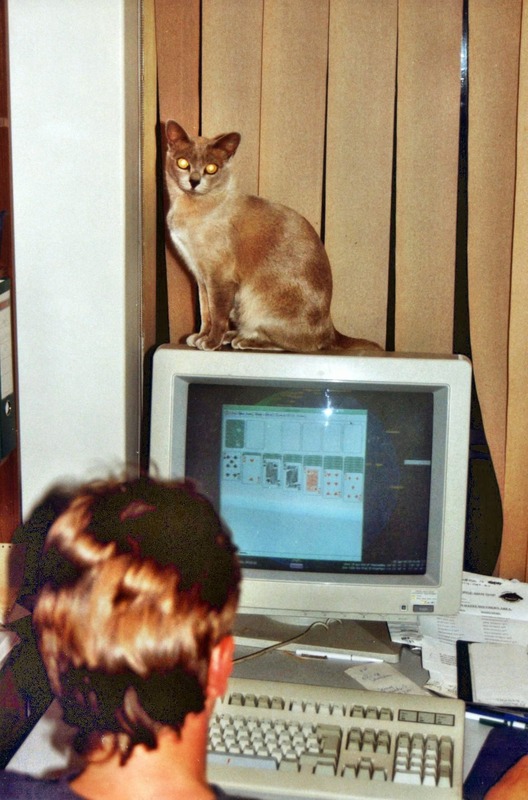 We gave Maddi to a friend of ours in Winter 2000 after the cats had been having some differences of opinion, and after a few weeks there she disappeared. We don't know whether she got bitten by a snake, run over (unlikely), stolen, or whether she just decided she liked the outdoor life (which is possible). With her back to us is Yvonne. Well, it smells like a cat. But it doesn't resist much. Finally, here they are all together (including Lilac), waiting to be fed. From top right, we have Choc, Maddi, Lilac and Monty. When this picture was taken, Maddi and Monty were a little less than 6 months old. 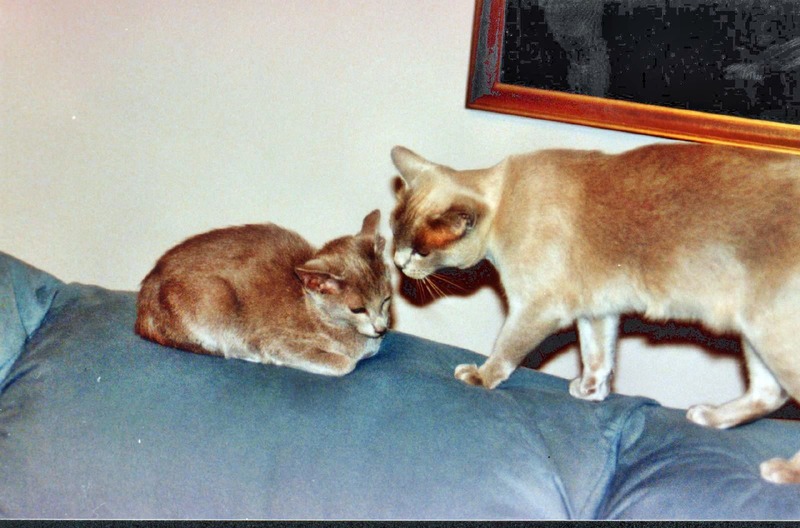 You'll notice how similar the coat of Lilac and Maddi is, but Monty is much darker than Choc (except on the nose, where the colour is the same). You'll also notice the silvery quality of the lilac coat. Finally, here are some photos taken in May and June 1999. 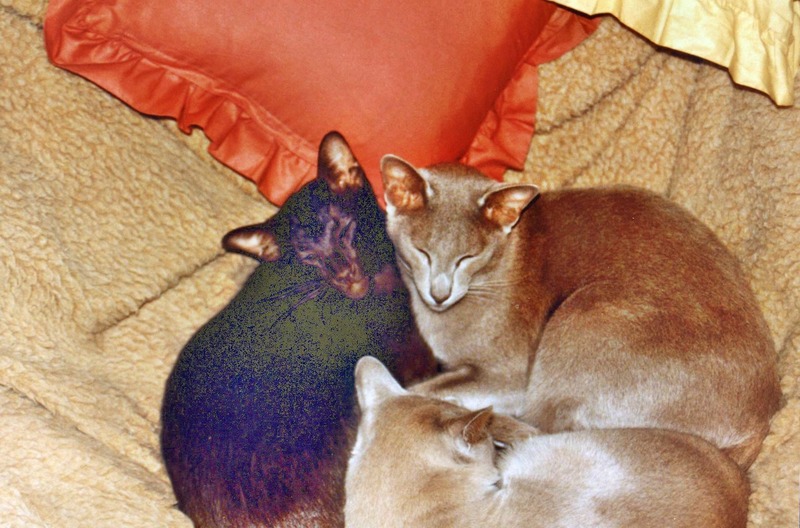 Choc had been gone for a while, and Maddi and Monty were fully grown (and larger than Lilac). 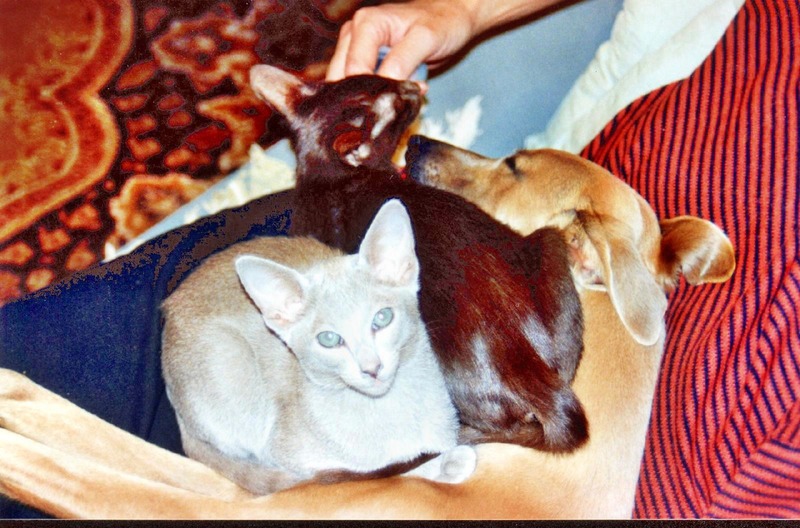 After Monty got run over in November 2000 we decided not to get any more cats. It was just too painful to see them get killed. I put it between 8 and 10 weeks, and not in nearly as poor a condition as she had suggested. It looks like a pure bred cat: long-haired tortoiseshell chinchilla, not the kind of moggie you see every day. The red looks more like cream, which suggests double dilution (see above; blue or lilac cream), but the dark hair looks more black than blue. If she really is double dilute, you'd expect her to be pure bred, since she would need two parents with the d gene, and it's pretty rare except in pure-bred cats. We decided to call her “Perdita”, meaning “lost”, after the name in “The 101 Dalmatians”. Here's a photo we took of her the day after she was found. The cream wasn't cream after all, it was red. I forgot how long it takes for the red colour to develop, and until it does, it looks cream. “Perdita” does not mean “lost” in Italian, it means “loss”. The correct word would be “perduta”, but we didn't like that name, so we ended up calling her “Fluffy”. Greg Edmonds told me that he had seen wild cats which looked like Fluffy. 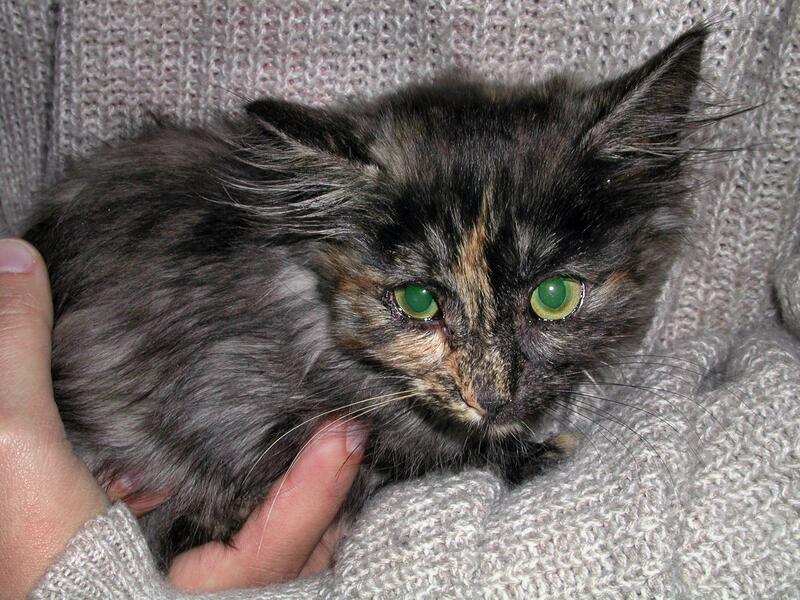 We now believe that she was a kitten (quite probably the only surviving one) of a feral cat. That would explain how she came to be so far from civilization. We're uncertain what happened to her mother. One theory I had was that she had been poisoned: at the time we found her, the neighbours had been spreading rabbit poison. On the other hand, rabbits and cats don't eat the same sort of thing. I'm coming to the conclusion that the most plausible explanation is that her mother was scared off by Diane arriving in the shed, and ran away. Diane found the kitten and took it away. There are a couple more on the raw photo page.